The historian Ramchandra Guha had once observed that two of the things that keep India together are cricket and Bollywood. If one were to think of a third unifying element it would undoubtedly be the national election. However, despite its pan-India appeal and its consistency in attracting wide public participation, it is surprising that the national election in India has not received the kind of nuanced attention that it deserves. It is not just a once-in-five-years examination that political parties and politicians are required to pass in order to be ‘promoted’ to the next government, although the media often projects it in this manner. However, a less highlighted aspect is that elections in India also reflect an unrecognized form of diversity: its ‘electoral’ diversity, which receives much less attention in comparison to the country’s diversity in other realms such as culture, history and ethnicity. One may argue that the 2014 national election in India marked a fall back to ‘uniformity’ as there was a common theme (‘the Modi wave’) that found resonance in many States. This argument could be partially challenged by citing instances of States (West Bengal, Tamil Nadu, Orissa and Telangana) where regional fronts continued to hold fort. However, even if one concedes that Modi’s PM candidature left a preeminent imprint on the election, I argue that the diversity story still persists. The main change in this election was that while there was commonality in the choice of the prime ministerial candidate, there was wide variation in the reasons why people chose to support the candidate. This variation is clearly visible when we turn to a State-specific analysis of the election results. For instance, the grand narrative in the State of Uttar Pradesh was that the BJP gain was driven by the shift in the non-Yadav OBC support in favour of the Party, but the story in the neighbouring State of Uttarakhand was quite different, with women voters having played an influential role. As we move further East we find a different narrative in the State of Assam where the Assamese-speaking adivasi voters had a defining influence. These disparate narratives suggest a striking peculiarity of the 2014 elections: The mandate in favour of Narendra Modi was driven by some sort of an ‘overlapping consensus’, where people from different States collectively voted for Modi but for altogether different reasons. This supposition opens the doors to more questions: What was the content of this overlapping consensus? How did Modi manage to tailor his communication in order to appeal to the constituents in different States? These are important questions, whose answers cannot be readily inferred from a macro-analysis of election results. Macro-analysis is, by design, efforts to find common threads or the binding forces reflected in the data. However, the problem with using a uniformity-inducing tool to explore a diverse phenomenon such as the 2014 election is that it leads to the overlooking of many nuanced insights. This argument, of course, does not intend to, in any way, criticize the usefulness of macro-studies; quite to the contrary they are extremely essential to track nation-wide patterns and the four macro-studies presented in the book are a flawless exposition of how to carry out a macro-study. However, for me, the crowning glory of the book are the numerous State micro-narratives that were painstakingly carved out by various State experts using a combination of statistical tools and observations from the field. What, I believe, was particularly commendable in these individual efforts was that they presented the analysis of the 2014 elections by highlighting the specific contexts within which the elections were contested. Each study reflected an independent effort to situate the 2014 elections at a critical juncture in the state’s electoral journey beginning from the past, transitioning into the present and opening up to the future. It is difficult to imagine that such a gigantic enterprise of documenting the electoral history alongside contemporary developments in every State could have been accomplished without an established team of State experts. It is the collective breadth and depth of political knowledge brought by the State scholars that makes the book a valuable contribution to the conversation on the 2014 elections. The book is fairly long and constitutes a collection of 23 chapters, so it is unwieldy to present a chapter-wise commentary. However, I will outline here some of my summary reactions, emerging from my reading of State studies. First, the book reinforces my earlier impression that India is an electorally diverse country. It suggests that the evidences of uniformity in the form of the common vote for Modi are only superficial, as it conceals deeper diversities over the reasons for supporting him. Second, it broadens the definition of what constitutes electoral diversity. Diversity, as the chapters reveal, is apparent in not only the vote choices in a particular election but is also reflected in more general and longer-term electoral patterns. For instance, some States tend to be persistently marked by high levels of anti-incumbency (e.g., Rajasthan), whereas in others pro-incumbency (e.g., West Bengal) is the predominant trend. In some States people prefer to vote the same governments at the centre and the States (e.g., Madhya Pradesh), while in other States different parties are elected (e.g., Karnataka). Third, there are some surprising inconsistences with regard to the core voters tied to political parties. Congress, for instance, attracts high levels of Dalit support in some States (e.g., Madhya Pradesh) but gets less Dalit votes in other States (e.g., Kerala). Similarly, BJP is able to garner substantive minority votes (e.g., Tripura) in some States but gets little in others (e.g., Gujarat). These diversities reflect the levels of complexity inherent in India’s electoral contests. The comprehensive coverage of the book and its textbook illustration of how a fine-grained election analysis should be conducted make it a valuable contribution. However, in the interest of stoking more refined work I have a few suggestions. The first is that, I felt, some chapters could have been more careful with the use of terminologies such as ethnic polarization, for instance. The data does show that the Hindus voted in larger numbers for the BJP but so did the Muslims, albeit the rise in Muslim vote for the BJP was much smaller. However, I feel it was premature to conclude, based on this evidence, that the 2014 elections reflected religious polarization at the national level. If such a far-reaching conclusion had to be supported, we should have found a drop in the Muslim vote for BJP. In light of this and other observations from the book, I would suggest that political researchers adopt a more nuanced interpretation of data. I feel this suggestion is pertinent now as we live in a world of hyperactive media, where provocative words such as ‘polarization’ tend to receive exaggerated attention. A second shortcoming is that while the book serves as a rich repository of State analysis, I do not see a concrete attempt at bringing together the disparate insights into a cogent narrative. Going by the arguments that I made earlier, I feel an exploration of the broad contents of the overlapping consensus that characterized the 2014 election may have performed one such binding role. Overall I recommend this book to both scholars and casual readers. For students on Indian politics, I suggest that some chapters be included as reading for any masters or doctoral course on Indian politics. 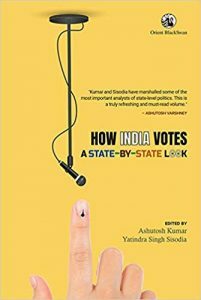 For casual readers, the book would enrich their understanding of the electoral complexities undergirding India’s democracy. At the end of my reading, I was left with a deep sense of awe at the enormity of the challenge that political parties in India face when they contest elections in a diverse country like India. While we already know about the diversities in culture, history and ethnicity, the chapters in this book bring to light a less discussed form of diversity, electoral diversity, which continued to hold weight in the 2014 election. Ajit Phadnis is a faculty with the humanities and social sciences area of the Indian Institute of Management (IIM), Indore.